Click on the menu items below to get more information. This is a year of local municipal elections. We have great candidates for three of the open positions in the Town of New Baltimore: Jake Colwell and Jim Eckl for two open Town Council Member positions and Diane Jordan as Tax Collector. Question 1 – Shall there be a convention to revise the Constitution and amend the same? Question 2 – Allowing the Complete or Partial Forfeiture of a Public Officer’s Pension if He or She is Convicted of a Certain Type of Felony. Question 3 – Authorizing the Use of Forest Preserve Land for Specified Purposes. Additional reliable and unbiased information about these ballot questions can be found in the “NYS League of Women Voters 2017 Voters Guide: Part 2 Ballot Proposals”. 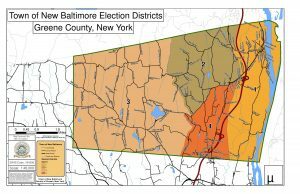 New Baltimore has four voting districts. If you are not sure what district you are in, click to see a map of voting district boundaries. If you still need help to figure out what district you are in and where to vote, contact us. You can register to vote by mail, in person or on line. If you are not sure whether you are registered to vote or not, you can CLICK HERE to find out. If you have questions about registering to vote you can call the Greene County Board of elections at 518-719-3550. BY MAIL or IN PERSON – To register by mail or in person way you will need to complete a voter registration form that you can download here. You can also call the NYS voter registration hotline at 1-800-FOR-VOTE to request a voter application. MAIL REGISTRATION – Application forms must be postmarked no later than October 13th and received by the Greene County Board of Elections, 411 Main Street, Catskill, NY 12414 no later than October 18th to be eligible to vote in the 2017 General Election . Notices of change of address from registered voters received by October 18th, 2017 by a county board of elections must be processed and entered in the records in time for the General Election. If you are not sure you will be able to get to the polls you can vote by absentee ballot. It is important and it is an easy process. First you have to fill out the application for absentee ballot and mail it to the Greene County Board of Elections, 411 Main Street, Catskill NY, 12414. It must be postmarked at least 7 days before the election (October 31, 2017 at the latest by mail). If you are late the form can be hand delivered to the board of elections up to the day before the election. Next, the Board of Elections will send (or hand) your absentee ballot materials to you after your application is received and processed. You will receive two envelopes in addition to the ballot. The first (outside) envelope will include identifying information so that the BOE can check that you did not sign in at the polls on election day. In order to keep your ballot secret, there is a second envelope to contain the ballot. This envelope has no identifying information. The two are separated before the ballot envelope is opened. The ballot must either be postmarked no later than the day before the election or personally delivered to the board of elections no later than the close of the polls on election day. Detailed instructions, including options to make it more convenient for military or persons with disabilities are printed on the back of the absentee ballot application.